We’ve been meaning to post about our Disney trip a couple of months ago, so behold! 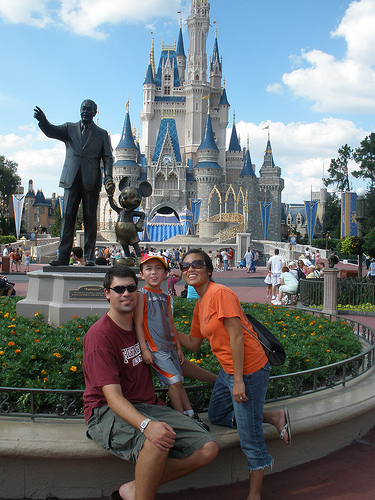 Disney pictures! We went with my parents and stayed on site at the Saratoga Springs Resort. We went the week in September between the two hurricanes, and the weather was great – a little hot, but at least we didn’t get rained out the entire week. Hubs and I had actually managed to keep Disney a secret from Bug the whole time we were planning it. He knew we were going at some point in the distant future (we had been talking about going for about a year), but didn’t know our vacation was actually planned. We broke the news to him (on video!) during the car ride to the airport. I had to show him the tickets before he would believe us – a skeptical four-year-old is probably one of the funniest things to see. Of course we hit up all the parks – Magic Kingdom, Epcot, Animal Kingdom, Hollywood Studios (formerly MGM Studios), and Hubs and I got to take advantage of the extra late hours for resort guests. This was the perfect time to bring Bug – to him, everything was still so real…yes, that really was Mickey, the mouse himself, and all the shows were like real life to Bug. He even got frightened when the villains would come out during a stage show and ask to go back home! One evening we got to participate in a Halloween night – only those who purchased separate tickets were allowed back in the Magic Kingdom, where all the characters were dressed in costume (like, a double costume, I guess…) and the kids got to trick-or-treat around the park. Bug wore his Batman costume from last year and was so proud of himself when he was brave enough to pose with Captain Hook and the witch from Sleeping Beauty. They also put on a Halloween parade, which Bug really enjoyed – and Hubs and I got to stay out late while Mom and Dad took Bug back to the hotel. It’s kind of fun watching a 6’5″ man squeeze himself into a roller coaster cart. The food was AMAZING. Of course. We signed up for the meal plan, which is really the way to go when you go to Disney. Next time, though, we’ll know better and really get our money’s worth. It’s the same set price for all the meals – whether you’re getting a sandwich for dinner or dining at one of their five-star restaurants. We were lucky enough to book some character dinings, which apparently books up months in advance. Bug got to eat breakfast with Playhouse Disney characters, lunch with Mickey Mouse, Chip and Dale, Pluto and Goofy, and dinner in 100 Acre Wood. That was probably one of the best experiences for Bug, because all the characters would visit each table, sign their “autographs” and generally just play while we ate some delicious eats. 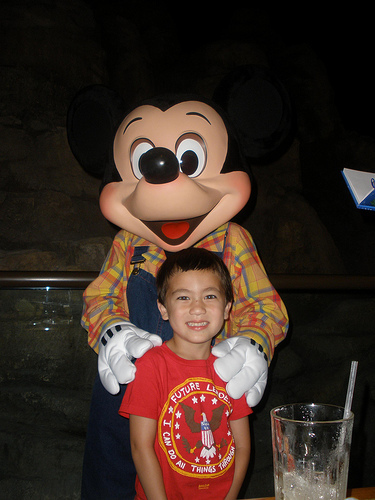 Bug was thrilled when he met Mickey Mouse for the first time. It really is neat to watch your kids experience Disney World for the first time at an age where the magic is real. I thoroughly recommend it! you blog already, you non-blogger! PS. We need to see the video of your skeptical 4-year old when you broke the Disney news. Pronto!